A kit with 3 in 1 balm that reduces the dark circles, puffiness and fine lines and wrinkles. 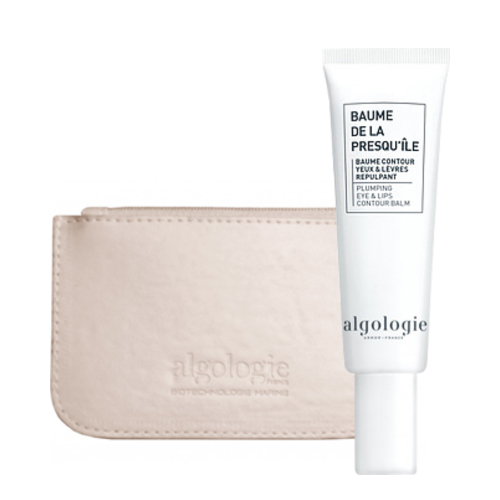 Algology Plumping Eye & Lips Contour Balm is an intensive anti-aging formula that softens the skin around the eyes. The cream, which is wonderfully soft and creamy to the touch, fills up wrinkles and restores the lip contour. The Algo4 complex with various seaweeds stimulates the skin cells and keeps the cells vital. Reduce dark circles under the eyes. Hyaluronic acid and tamarind moisturize the skin and provide maximum comfort. Remineralising seawater balances the skin. Suitable for skin with wrinkles, fine lines, and dark circles. Algo 4 Complex, Alpine Sea Holly and Sea Fennel, Hyaluronic Acid, Laminaria, Marine Biopolymers, Botanical Biopolymer. Apply morning or evening on a perfectly cleansed eye and lip area.